Why Won’t My 4 Month Old Sleep Like She Used To? Tired mama, does this sound familiar? All sleep experts (that’s me) agree that the four month regression is the real deal, it’s permanent, and it’s biologically caused. We also agree that it can cause really struggles for babies and mamas alike. 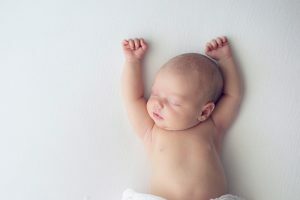 Before I dive into explaining WHAT THE HECK IS GOING on with sleep now, it’s important that we talk about WHY the sleep changes at four months are different from other changes that your baby will go through with sleep. To best understand what’s happening to your baby during this change, first I need to explain to you a few things about sleep in general. Many of us just think of sleep as an on/off situation. You’re either asleep or you’re not, but this could not be further from the truth. In fact, sleep actually has a number of different parts (referred to as sleep stages) which make up each “sleep cycle” that we go through several times per night. As newborns, our little bundles only have 2 stages of sleep, and they tend to spend about half their sleep in each stage to make up their full sleep cycle. Newborn sleep is relatively deep (more on this later) which allows us to easily hold our babies until they are sleeping and then gently transfer them into a bassinet, crib, stroller or swing! You’ve finally gotten the hang of things and have a peacefully sleeping baby who can sleep anywhere and through just about anything. This is what makes us feel REALLY good as moms. Baby is 10ish weeks old and FINALLY SLEEPING! Yahoo. And just like that, things change! But it doesn’t take long as a parent to realize… Just when you feel like you’ve gotten the hang of this whole parenting gig, your kiddo goes and changes it up. So naturally as soon as you have a generously sleeping newborn, they hit the third or fourth month, and there is a biological reorganization of sleep. Rather than having 2 stages of sleep for much longer, babies now embrace the 4-stage method of sleep that they’ll continue to follow for the rest of their lives. Stage 1: The initial stage of sleep we’re all familiar with where you can just feel yourself drifting off, but don’t really feel like you’ve fallen asleep. Anyone who has ever seen their partner nodding off in front of the TV, told them to go to bed, and gotten the canned response of, “I wasn’t sleeping!” knows exactly what this looks like. This is the drowsy or dozing part of the sleep cycle. Stage 2: The first “true sleep” stage. This is where people tend to realize, once woken up, that they actually were sleeping. For anyone wanting to successful take a “power nap”, this is as deep as you want to go or you’ll wake up groggy. Stage 3: The deep and regenerative portion of the sleep cycle. This is when the body starts repairing and rejuvenating the immune system, muscles tissue, energy stores, and sparks growth and development. Stage 4: REM (rapid eye movement) sleep. In REM sleep, the brain starts to kick in and consolidates information and memories from the day before. REM is the stage of sleep where most dreaming takes place. Once we’ve gone through all of the stages, we either wake up or come close to waking up, and then start over again until the alarm goes off. So what in the heck does all this sciencey-stuff does have to do with the dreaded four month regression we were talking about originally? Well… When this change takes place (around the fourth month), baby moves from 2 stages to 4 stages, and the extra 2 stages are comprised of much lighter sleep than they are used to. With more time spent in lighter sleep, there’s MORE of a chance that baby’s going to wake up. This also means there is LESS of a chance that you can successfully transfer them from sleeping in your arms to sleeping anywhere else. Waking between sleep cycles is a very normal (and safe) part of the sleep experience, BUT it can totally wreck havoc on the lives of parents around this four month mark. When adults wake between sleep cycles (and start the stage 1 – drowsy sleep again), we are able to identify certain comforting truths that a young baby is not able to. We are able to recognize that we are safe in bed, it’s still dark out and we have multiple hours to sleep before our alarms go off in the morning. And so, we do. Usually this happens so quickly that when we wake the next morning, we don’t even remember these brief encounters with consciousness that happened throughout our night. BUT, your four month old baby is not an adult so she is lacking these critical thinking skills. To her, falling asleep while nursing and cuddled up to mom and then waking up in a dark room flat on her back with no food and no cuddles feels VERY DIFFERENT. But this feels different, mama! This difference comes at the end of one sleep cycle, before starting the next, and comes with the realization that mama is not around. She’s suddenly not entirely sure where mama went and so the natural response is to freak out a little bit. This fear stimulates the fight-or-flight response and, next thing you know, baby’s not going back to sleep without a significant amount of reassurance that everything is OK. The other major contributor to this four month fiasco is that up until this point, parents have either been putting their baby to sleep with a pacifier, or by rocking them, or by breastfeeding them, or some similar technique where baby is helped along on the road to falling asleep by using a sleep prop. Once baby reconfigures sleep to match the four stage sleep cycle, she is spending more time in light sleep, and therefore has a higher probability of waking up. The sleep props, or sleep associations, that are used can be very sneaky because although they may be helpful in getting your little one to that initial nodding off stage, she may become dependent on needing it to fall back to sleep after waking in the night. When baby wakes between sleep cycles and doesn’t have the paci or rocking chair to initiate sleep again, you can go ahead and cue up the fight-or-flight, the crying and the adrenaline all over again. When this starts happening every 45 minutes to one hour, parents find themselves in a nightmarish situation with lots of anxiety and not much sleep. If you’ve gotten this far in the blog post, you have learned a LOT about what’s happening with your little baby at this point. The good news for you is that this change actually not a “regression” at all. 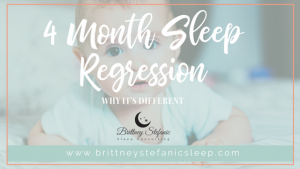 A regression is defined as “reversion to an earlier mental or behavioral level”, and that’s actually the opposite of what your baby is experiencing. I would prefer this change be called the “Four Month Sleep Progression” because baby is moving from the sleep of a newborn to the sleep of an adult! She is PROGRESSING and growing up, and we should be proud of this milestone! But I understand that it’s hard to be proud of a change like this when you are totally exhausted and up all night with an crying baby. So, let’s get to the good stuff! Add a white noise machine into baby’s nursery. One of the culprits of crummy daytime and night time sleep is external noise. Whether it’s the package delivery man, your loud dog warning you that the neighbor is walking by or something falling on the floor three rooms away because big brother loves to throw things, unexpected noises like this can startle a baby awake no matter where they are at in their sleep cycle. This is especially true now that she is spending more time in lighter sleep. Make sure the nursery is DARK. Get all of that light out of baby’s room and please note that having blackout shades is not always enough. Newborns and infants are not afraid of the dark. They are, however, responsive to light. Light sends a signal to their brain that it’s time for activity and alertness, and the brain secretes hormones accordingly. Keeping the nursery pitch black during naps and bedtime will help to prevent this biological response to seeing the light which increases the chances of successfully connecting sleep cycles independently. If you travel a lot, check out my favorite products for sleep and travel by SnoozeShade. This UK-based company is one of my favorites because she prioritizes sleep, protection and safety when creating her products and I DO, TOO! (If you use the code BRITT222 at Amazon check-out, you’ll get 10% off your purchase). We heavily rely on our SnoozeShade for travel with our toddler because it helps me insure his Pack and Play is dark no matter where we sleep! Try to keep the feed near the beginning of the routine and plan the songs, stories, getting into PJs and some sort of wearable blanket/sack. I like this one lots! (If you use that affiliate link of mine, you’ll get free shipping with any $50 purchase)! *Note: If you are making it to the routine part of noticing baby getting fussy or drowsy before bedtime, you’ve probably waited too long. Four month old babies should really only be going about two hours between snoozes, and bedtime should be between 7 and 8 at night. Of course, there are sure to be regressions, actual regressions, later on in your little one’s life. Traveling, illness, cutting teeth and learning new developmental skills can all cause your little one to have a few bad nights in a row. But when it comes to the four month “progression”, I’m happy to report that this is a one-time thing. Once you’re through this, your baby will have officially moved into the sleep cycle that she’ll be following for the rest of her life. Four glorious stages repeated multiple times a night. By taking this chance to teach her the skills she needs to string those sleep cycles together, independently, prop-free, without any need for nursing, rocking, or pacifiers, you’ll have given her a gift that she’ll enjoy for the rest of her lives… The gift of sleep! As with anything, some babies are going to take to this process quickly and easily while some will be a little more resistant. If your baby falls into the former category, count yourself lucky, take delight in your success, and go ahead and gloat about it on Facebook. No one will blame you for being proud of your sleeping baby. Except for maybe all of your friends who are not quite so lucky! For those of you in the latter camp, stick with it and know that this is just a phase! Sleep is a skill and teaching this skill takes consistency and commitment, but imagine the full nights of sleep that are ahead for your family and use that as motivation! And if you need help getting there, you can book a FREE EVALUATION call here or contact me to learn a little more about how I work with families just like yours – sleepy and ready to get some much deserved rest! I’m Brittney. Your supportive Sleep Sense Consultant. 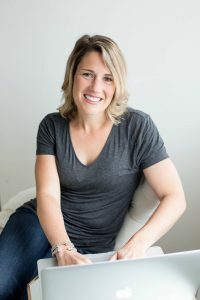 I educate and support families in finding sleep solutions for newborns, babies, toddlers and school-aged children so everyone gets the sleep they need and deserve. As a VIP, you'll get twice monthly emails filled with sleep tips and tidbits, business updates and success stories from well-rested families! © 2017-2019 Brittney Stefanic Sleep Consulting. All Rights Reserved.